On my way down to New York Theater Workshop last night to see the wonderful new production of Sontag: Reborn, I was reading, as I often do, on the subway. I’m currently about 70% through, and absolutely loving, Patti Smith’s memoir Just Kids. Though Susan Sontag and Patti Smith don’t share the same style, little did I know how much the two pieces would end up speaking to each other. Smith’s book recounts her early years in New York, when she and the artist Robert Maplethorpe were constant companions, romantic and otherwise. She describes, in beautifully poetic language, her experiences finding herself as a person and an artist. Sontag: Reborn, too, is about personal and creative pursuits. It is about discovering, and constructing, an identity. Using the writer’s own journals as text, the fabulously talented Moe Angelos depicts Sontag from her teenage years into her mid-30’s. While their artistic pursuits are different, and each woman’s journey is singular, experiencing these two pieces of art in such close proximity to each other, without having intended to do so, felt something like artistic kismet. Choosing to focus on the period of time before Susan Sontag became a famed critic and novelist, Sontag: Reborn is an incredibly powerful depiction of intellect and humanity. Her words, even when she was a teenager, demonstrate an uncanny intelligence and insight, both into the world around her and into herself. Her constant pursuit to consume, to learn, and to discover, is inspiring. In the show, just the right balance is struck between her professional pursuits and her romantic ones. That, after all, is what Sontag struggled with for much of her early life, and to see her embrace her queerness as she starts to tap into her artistic potential feels exciting and revelatory. And, in some ways, instructive. Angelos’ nuanced portrait, along with a seamless production design that projects objects and words, as well as an older, more knowing (and more judgemental) version of Sontag onto a screen in front of the stage, made me feel like I was diving into Sontag’s brain. I liked being there. There are easy traps a bio-drama can fall into it; Sontag Returns fell into none of them. It felt like a brilliant memoir of a brilliant mind come to life before me. Like, say, a theatricalization of Just Kids. I won’t say much more, since I’m not yet finished reading the book, but like in Sontag Reborn sexuality and creative output are inextricably linked. So is owning the power of what you are capable of producing. Important figures like Maplethorpe and Sam Shepard are represented vividly. It makes me long for my early, developmental days in New York City, but also grateful that the hardest periods of struggle are behind me. I admit, embarrassingly, that I didn’t know much about either Susan Sontag or Patti Smith before encountering these two works. I had read “Notes on Camp” in graduate school, and have heard some of Smith’s songs, but that’s about the extent of my knowledge. Now, I want to devour everything I can by both women. Read Just Kids. See Sontag Reborn. (It closes this weekend). Maybe do both at the same time. It worked for me. 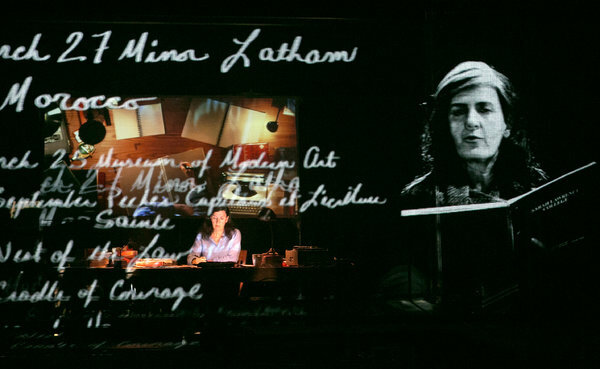 Sontag Reborn is playing at New York Theater Workshop. Running time is 85 minutes with no intermission. This entry was posted in Books, Theater and tagged Just Kids, New York Theater Workshop, Patti Smith, Sontag: Reborn, Susan Sontag. Bookmark the permalink.